Blazing Star Gardens: Design and landscaping services. Phone orders for pick up (Owatonna) or delivery. Boreal Natives: A satellite of Prairie Restorations. Esko, MN. Dragonfly Gardens: Dragonfly Gardens carries a wide range of native perennials, grasses, ferns, shrubs, and trees to restore native habitats from shoreland, wetlands, and forests, to prairies. Amery, WI. Ecoscapes Sustainable Landscaping: Design and landscaping services. Delivery only for plant stock. Glacial Ridge Growers: Saturday St. Paul Farmer’s Market. Kinnickinnic Natives: Retail location in River Falls, WI. Landscape Alternatives: Shafer retail location. Mama Terra Gardens: Professional landscape services. Minnesota Native Landscapes: Minnesota Native Landscapes is a full service ecological restoration company. Ecological services range from native seeding to prescribed burning to bio-engineering, and everything in between. Ostego, MN. Morning Sky Greenery: A Minnesota Native Plant Nursery, growing native plants for shoreline restoration, raingardens and infiltration basins, and backyard butterfly, birdwatcher and pollinator gardens. Retail and online. Morris, MN. Natural Shore: Shoreline, ponds, wetlands, and prairies. Retail location in Independence, MN. Naturally Wild: Minneapolis location in May and June. Outback Nursery: Design and landscaping services. Hastings retail location. Pasque Ecological Design: Specializing in providing susainable landscape architecture services for residential, commercial, public, and institutional clients, including schools and faith-based communities. Simonet Design: Landscape master planning, site design, and sustainable landscape design. Sogn Valley Farm: Saturday St. Paul farmers market. Certified organic produce, native plants, and CSA. Sunshine Gardens Nursery: A full service landscaping company serving Pine River, Backus, Aitkin, Pequot Lakes, Crosslake, Ideal Township, Longville, Walker, Fifty Lakes, Outing, Brainerd, Grand Rapids, and Nisswa. Nursery located in Pine River, MN. True Nature Design: Design, installation, and management services. Numerous non-profit organizations need citizens to report their findings in the natural world. Many of these programs are great for families. Below is a sampling of organizations that rely on citizen scientists. Why Native Plants: Doug Tallamy, Ph.D.
Below is a sampling of regional and national organizations that share complementary goals of community environmental education, stewardship, and conservation. Join us for a weekend to celebrate the amazing spring bird migration here in Duluth, MN. Public education programs (migration interpretation & kid’s activities) at the West Skyline Spring Count, Spring Migration Workshop, Saturday Evening Presentation by Carrol Henderson (retired director of MN DNR Nongame Wildlife Program, author, and well known for restoration efforts for Peregrine Falcons, Trumpeter Swans, and Bald Eagles), and birding field trips to be offered. Saturday, April 27th, 1:00 p.m. – 4:00 p.m.
Nesting habitat is a critical yet often over-looked factor impacting native bee populations. This popular workshop lead by Sarah Foltz Jordan (Senior Pollinator Conservation Specialist with The Xerces Society) and Colleen Satyshur (University of MN) will provide practical approaches to create and manage nesting and overwintering habitat features for bees, including dead wood, stems, brush, rock piles, bare ground, leaf litter, and more. Approaches are relevant to gardeners, landscapers, natural resource professionals, and anyone interested in taking the next step in supporting pollinators. After the classroom activities we will go outside to search for active nests of stem-nesting bees! Space is limited, so register early! Saturday, May 4th, 9:00 a.m. – 12:00p.m. South Metro Water Forum will provide a venue for residents and local leaders to learn more about water quality efforts, challenges, and what you can do in your community to make an impact. We will take you on a journey through city, county, and state efforts to address water quality problems and provide opportunities for you to get involved. Hear from speakers, talk to organizations, and meet other people who have a passion for keeping Minnesota’s water clean for generations to come. Free and open to the public. The 13th Annual Native Plant Sale offers 6 collections and a variety of individual favorites in 3 convenient sizes available for pre-order. All plants available for pre-order are grown by a local Minnesota native plant nursery without the use of neonics. Order now, pick up June 1, 2019. Print an order form and mail it in. Must order by May 21. Saturday, June 15, 5:00 p.m. – 8:00 p.m. Yes, our site is closed while we undergo our $10 million site renovation. But, the show will go on! Please join us for a unique 2019 An Evening with the Construction Cranes Saturday, June 15, from 5 to 8 p.m. Like past An Evening with the Cranes, this event will include a variety of red and white wine, local brewery beers and an array of appetizers. This year’s celebration will be held in the International Crane Foundation Courtyard, where international staff will highlight the diverse landscapes of cranes. Registration for this year’s event is limited and cost $75 for members and $100 for non-members. June 8, 2019: 9:00 a.m. – 1:00 p.m. The Native Plant Expo and Market offers gardeners one convenient location to shop for Minnesota native plants from 6 local native growers and learn how to use the plants from conservation organizations. The goal of Landscape Revival is to promote the use of native plants by educating about their benefits for wildlife habitat, pollinators and water quality. Ongoing May-October, most Tuesday evenings. Interested in learning how to ecoscape with Minnesota native plants? Want to lend a hand in a spectacular public garden? Then say no more! Join our merry group of gardeneers (that’s not a typo!) to learn, volunteer, and enjoy an occasional ice cream cone. Visit the Naturescape’s facebook page to sign up to be notified about the season’s volunteer schedule. We roll up our sleeves most (but not all) Tuesday evenings from 6-8 p.m. Our schedule shifts to 5-7 p.m. when the sun starts to go down earlier later in the season. Fall is a thrilling time at Hawk Ridge! Be sure to visit this amazing migratory phenomenon. Hawk Ridge is known as one of the major sites for observation of raptor migration. Visitors come from all over the world in the fall. Indeed, our guest register has entries from thousands of visitors who have come from all 50 states and from over 40 foreign countries. Most raptors are reluctant to cross large bodies of water. When they migrate south and encounter Lake Superior, the birds naturally veer southwest along the lakeshore. They concentrate in impressive numbers on the bluffs overlooking East Duluth and can be easily seen from the overlook at Hawk Ridge. Of the 20 species of raptors and vultures that have been seen at Hawk Ridge Nature Reserve, the peregrine falcon and gyrfalcon are among the rarest. Whether species are common or rare, they are all thrilling to watch as they traverse the ridge, often at or below eye level. Naturalists are onsite until the end of October. Click the above link for visitor information. Who knew this was practically in our own backyards? Bring lawn chairs, a pot of coffee, binoculars, and enjoy life in the slow lane for awhile. 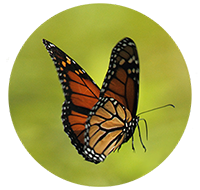 The Butterfly Effect is published four times per year by Neighborhood Greening. In it, we spotlight our successes, examine small but impactful changes we can make to become better stewards of our local environment, tell our “green” stories, and show how environmental stewardship directly enriches our community, families, and lives. Sign up to be notified when new issues are published. Your contact information will be kept strictly confidential and will only be used to send you issues of The Butterfly Effect and occasional update emails.